First, let’s start with the successes. . . This post contains affiliate links, which means that if you purchase something, I earn a small commission at no extra charge to you. Thanks for supporting Shifting Roots! This was not the first year I have started my own tomatoes, but I was far more adventurous with the varieties I tried. 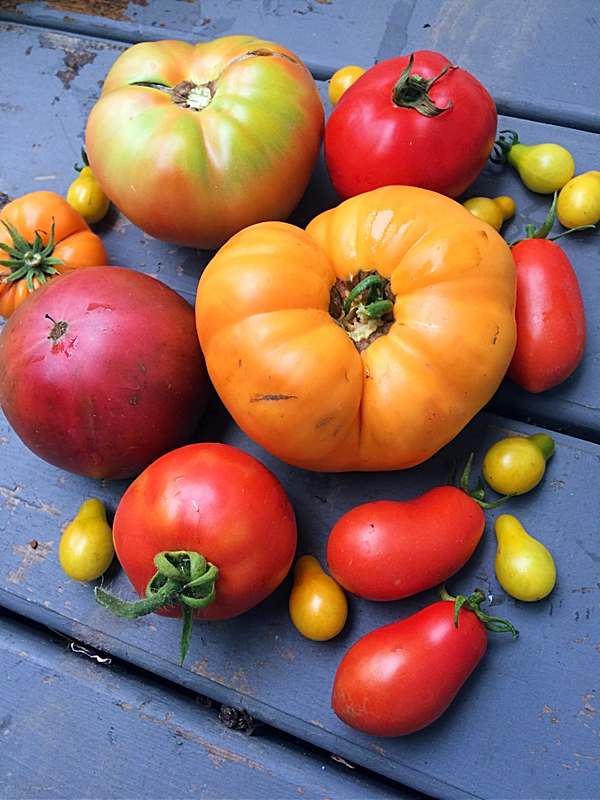 I prioritized heirloom varieties, and those that had faster dates to maturity. My favourites? Amanta Orange, Yellow Pear, San Marzano, and Black Krim. I also love Lemon Boy, but they just didn’t do as well this year. Next year I want to concentrate on fewer plants, but better quality. 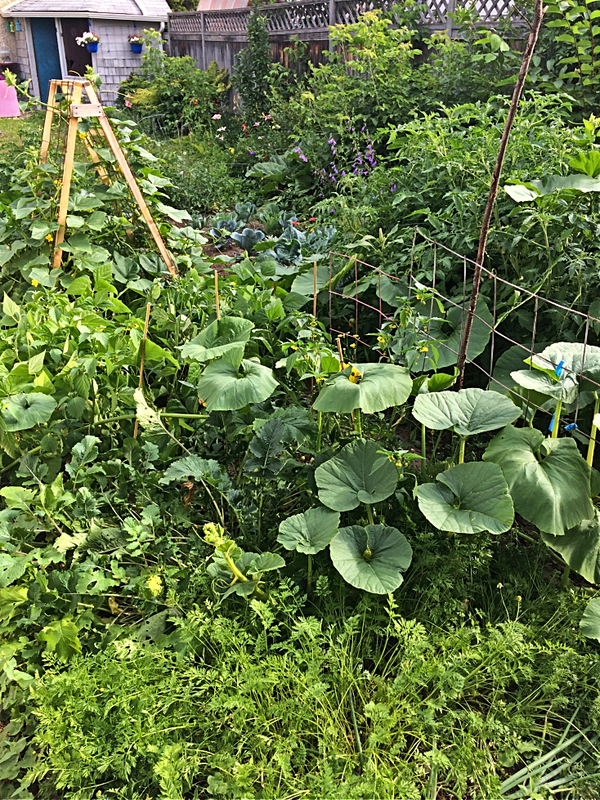 I will prune more, build sturdier cages, and not create a “tomato jungle.” Square foot gardening is great, but tomatoes need some space to breathe. On that note. . . 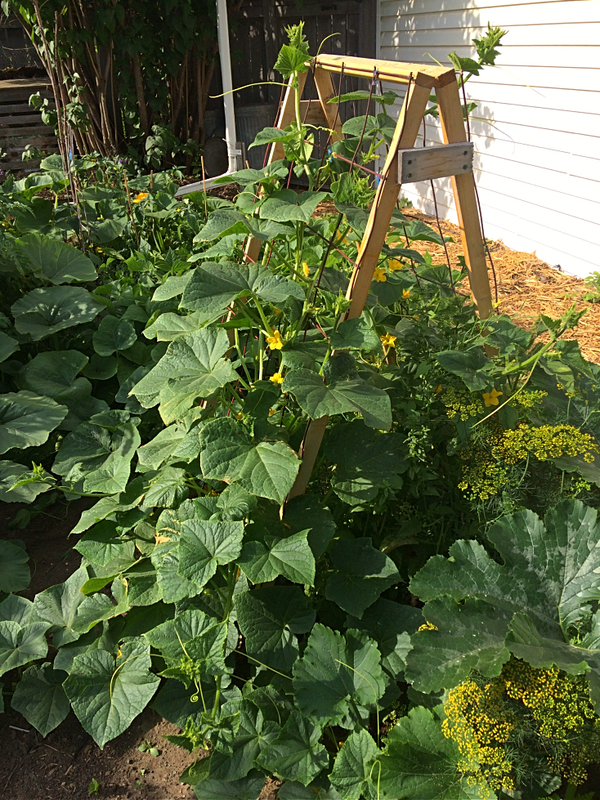 This was the year of the square foot garden. 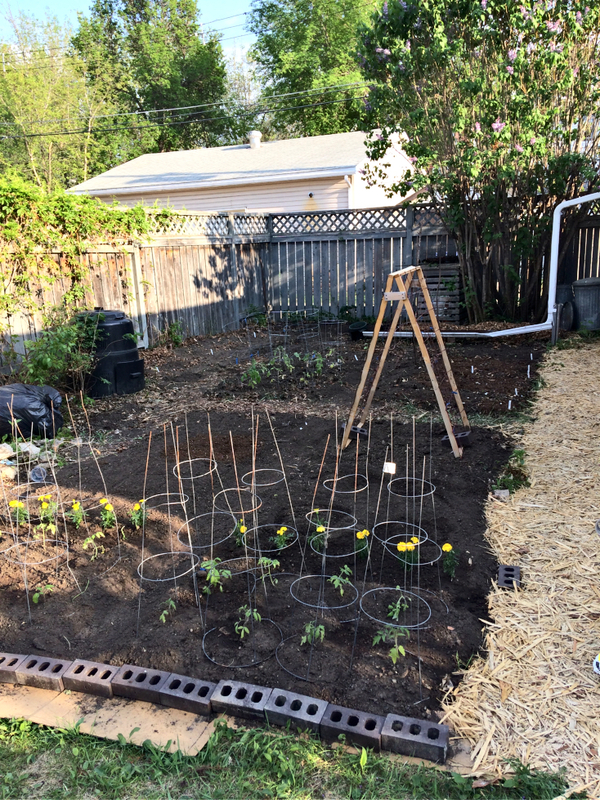 I was planning on trying it out anyway, after reading Mel Bartholomew’s book on the subject, but a collaboration with Vinyl Raised Garden Beds and the Seeding Square sealed the deal. 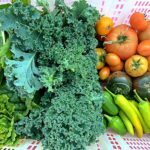 I could not believe how much more produce I could fit in my garden using the square foot gardening method. I actually had a bit of room left over to try out other vegetables. The Seeding Square made it fool proof. 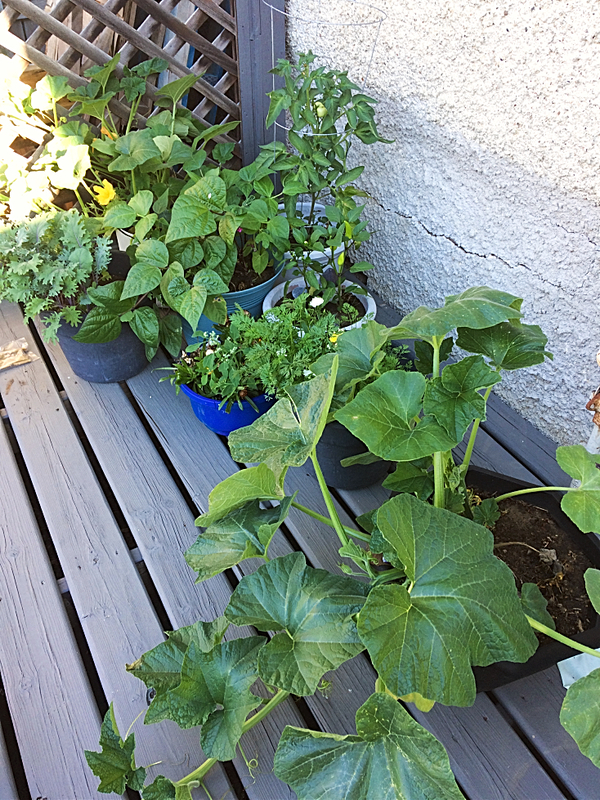 There was no guessing which plant needed how much space, and my son even helped me put some vegetables in–huge win!! 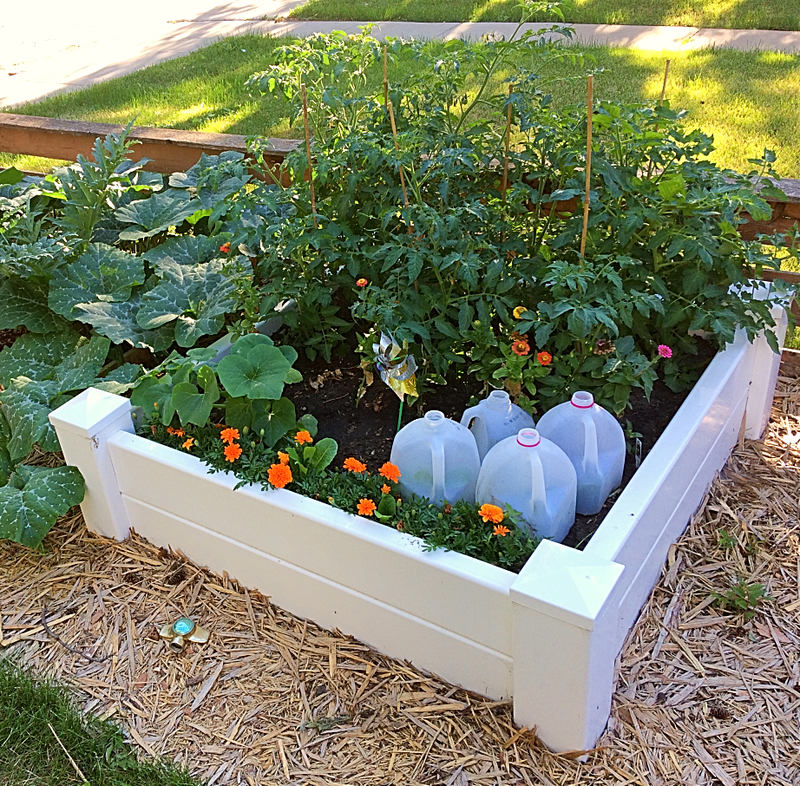 Start your square foot garden the easy way! 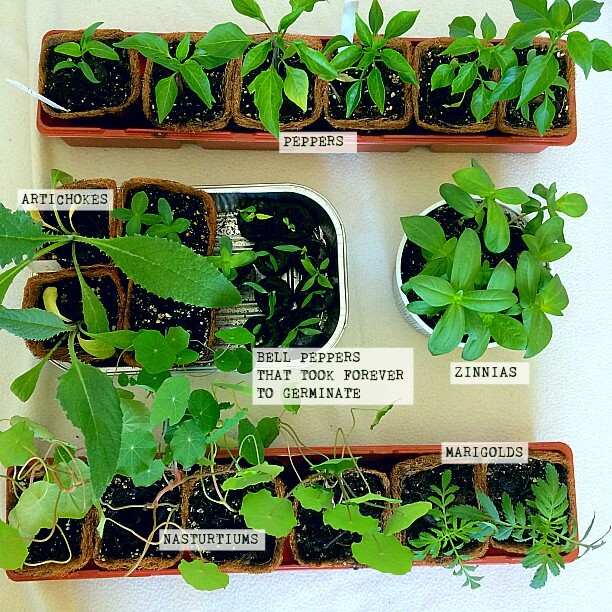 Plus a short 3 day email course of how to get started with square foot gardening. 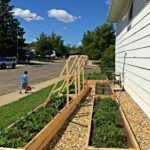 I also loved my Vinyl Raised Garden Beds. They are a bit of an investment, but they look so good, are super simple to assemble, and look amazing. I have mine in my front yard, and people walking by were constantly stopping (or slowing down) to check out the vegetables. If you’re not a committed DIY’er, save yourself the hassle and just get vinyl raised garden beds. Wouldn’t you rather be gardening than staring at a bunch of unassembled 2X4’s in shame, cursing yourself for biting off more than you can chew? If you’re short on space, trellises are your best friend. Last year I successfully grew Jack be little pumpkins on a trellis, and this year my cucumbers co-operated on their A-frame trellis. Those images on Pinterest don’t lie! Plant spinach underneath your cucumber trellis and you’ll be glad you did! If you struggle with growing peppers (bell peppers. . . I’m looking at you!!) Try Hungarian wax peppers. When I couldn’t take care of my garden well anymore, the Hungarian wax peppers just kept on producing. They are also the only plant that can handle the intense oven that is my very sheltered south-facing deck. 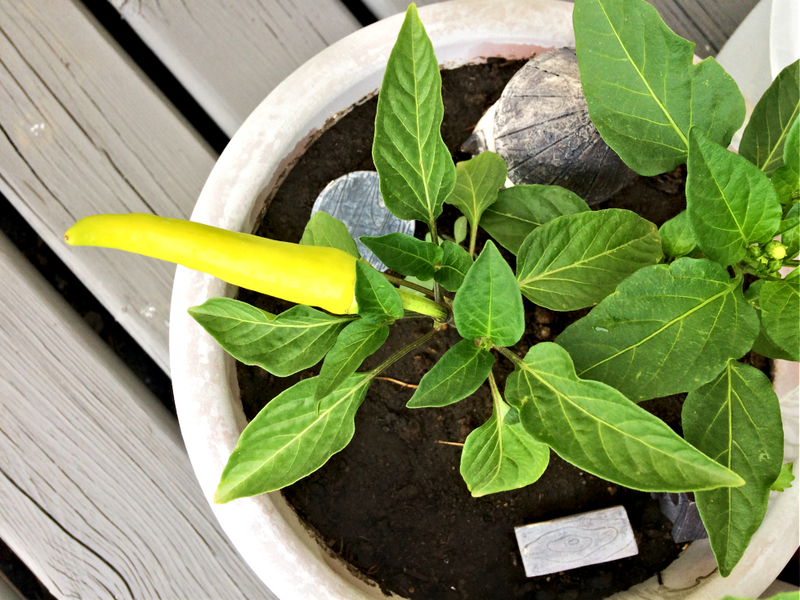 This Hungarian Wax Pepper was the only vegetable in my container garden to be truly successful this year. Now onto the failures. . .
My container garden started out strong, but intense heat coupled with too-small pot sizes meant that they couldn’t make it all the way through to August. You can read about the whole ordeal here. 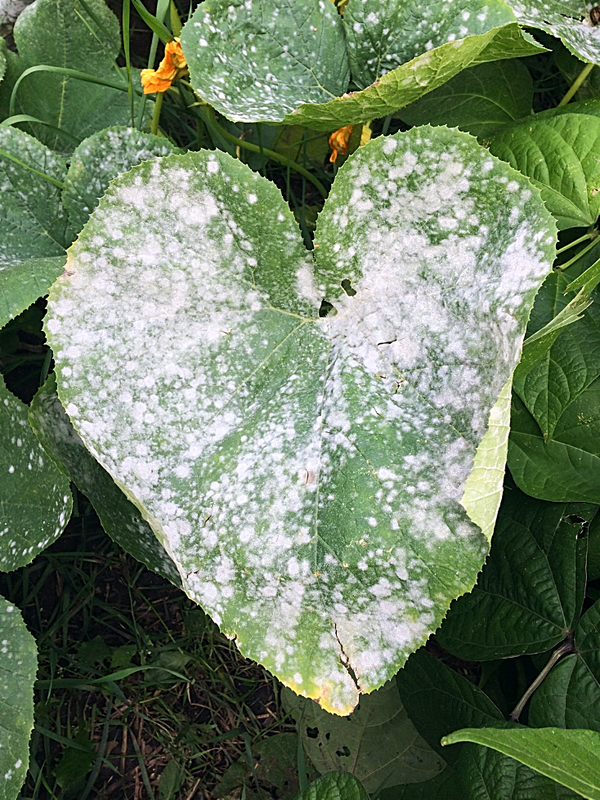 Heat Waves, Powdery Mildew, Blossom End Rot, oh my! I’ve never experienced a summer as a gardener in which every day was between 27-30 degrees celsius. The growing conditions were very challenging–very little rain and few breaks in the temperature. Despite my best attempts to water every day, it just wasn’t enough–especially once I was put on modified bed rest and simply had to give up. Needless to say, my garden was overrun with blossom end rot and powdery mildew. There’s ways to fix it, but with my health issues, it just didn’t happen. On the bright side, I actually had a manageable amount of zucchini. Click on the link to see how I stop powdery mildew from spreading and fix blossom end rot in two weeks. Now for things I hope to do next year. . . I also have a new appreciation for annuals, and will be planting more marigolds, zinnias, nasturtiums, poppies, sunflowers, and whatever else I can be convinced into growing! 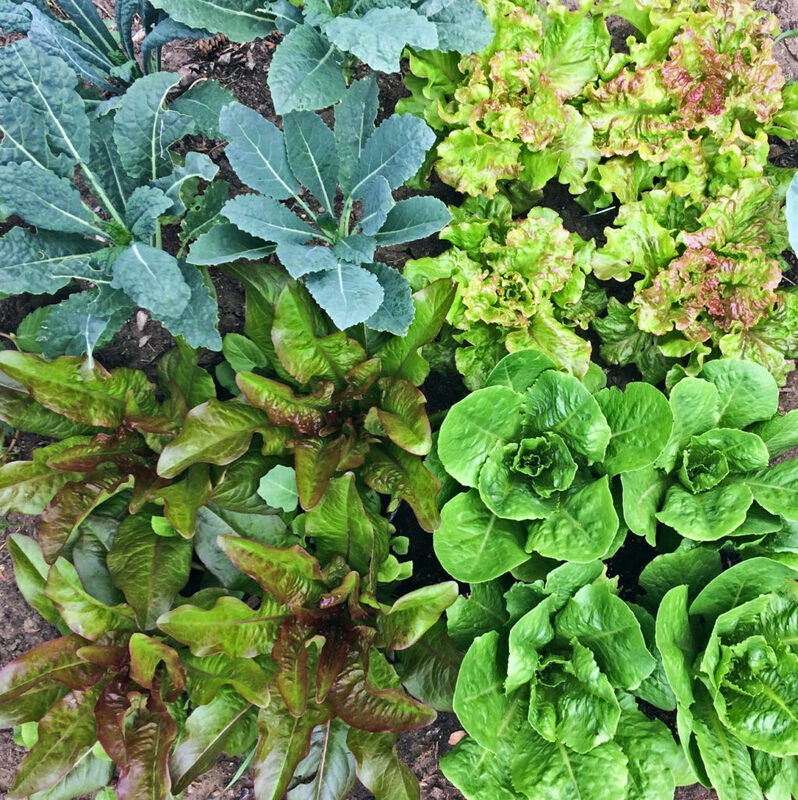 I always knew that lettuce came in a range of reds, greens, and purples, but I never realized how beautiful they could be together. Expect a garden that’s grown with more photo-ops in mind. Do I recommend this for everyone? Certainly not!! However, I am a garden blogger and I was disappointed this year with how un-photogenic my garden was. Except for this lettuce and kale combo–it was gorgeous!! This year I was obsessed with starting my own seeds as much as possible. But then I got overly attached to them and ended up with 120 tomato plants and tons of squash and who knows what else. 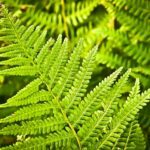 It got to the point where if a visitor came to my house, they left with no fewer than 6 plants–and a “who cares if they die!” speech. I felt embarrassed and frustrated with myself, then had the revelation to poll my audience and see if this was something that really mattered to them. Only 25% of you actually start your own seeds. I decided right then that I would still start seeds, but that there was no reason to have them overtake the whole house when it was something that didn’t even matter to 75% of my readers!! There are tons of fantastic local greenhouses where I live and I’m happy to support them next year. So that’s it! While I’m equal parts happy and frustrated with how this year went, I’m also already planning out my space for next year. Do you have my free garden planner? If you don’t, download it now and fill it in with your own successes, lessons learned, and plans for next year. You’ll be glad you did! What flowers are those?! The bright pink ones with the yelllow in the center... SO BEAUTIFUL!!!!! 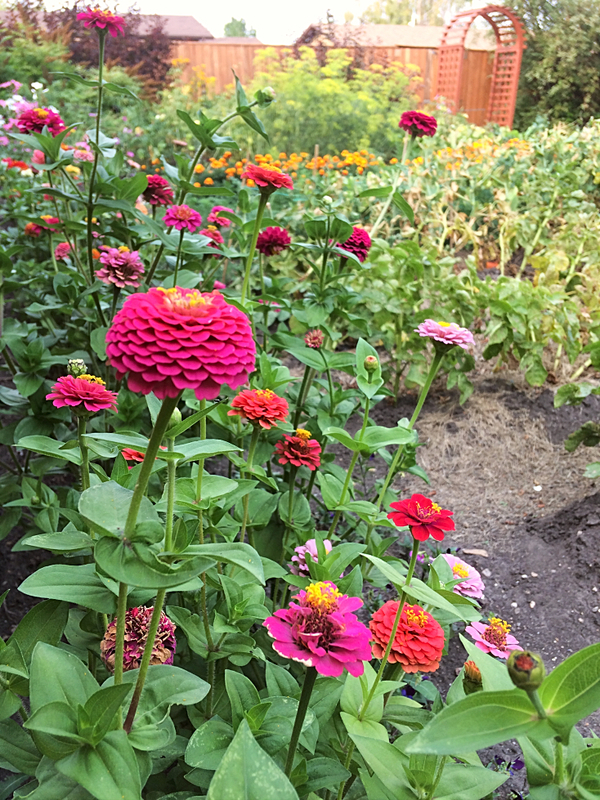 They are zinnias and they are one of my all-time favourite flowers!! Zinna's come in so many different colours and sizes. Once you grow them you'll be hooked!